After a full day of travel, first from Los Angeles to Honolulu, and then Honolulu to Kona on the Big Island, we were all a bit travel weary. By the time we got to the hotel at Keauhou Bay, we all just wanted to get settled into our rooms and put our feet up for a little bit. However, after having traveled all day, and with little to nothing to eat for most of us, it was rapidly approaching sunset and dinner time and we needed to regroup and go in search of food. Luckily, only about a mile or so from the hotel there was a nice shopping center with a restaurant that my husband and I had considered dining at when we visited last year. We had actually talked about this particular restaurant in advance of our trip as a potential night one dinner option for the family if everyone felt up to going out for food as it was supposed to be good, and it was really close by. Sam Choy’s Kai Lanai, owned by the famous celebrity chef, Sam Choy. 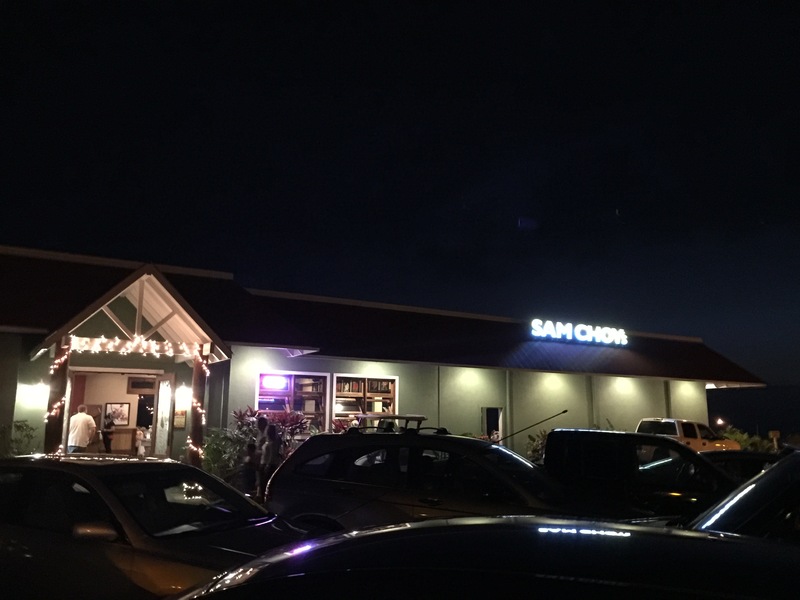 Sitting atop a hill, at one of the highest points in the area, Sam Choy’s has an indoor-outdoor atmosphere. With a lanai-type setting, there are outdoor tables with fire pits, and all of the inside area of the restaurant opens up to the outdoor lanai. During the day time, the restaurant features a 230-degree, undisturbed view of the Pacific Ocean. At night, the outdoor lanai lends itself to cool breezes that come off the ocean. With an eclectic Hawaiian fare, the restaurant has a glass fronted kitchen where you can watch the chefs prepare your meal. This was a great setting for our first meal in Hawaii. Dining in a tropical location calls for tropical drinks. 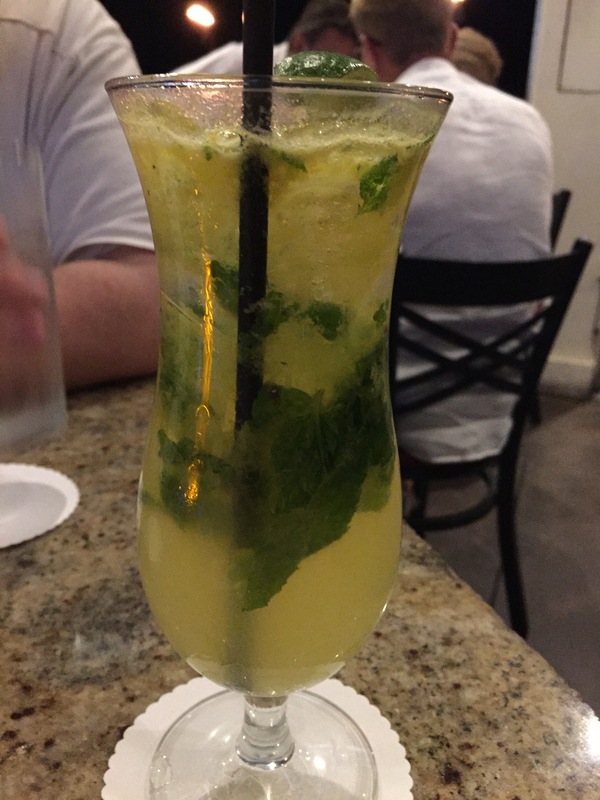 My husband decided to order himself a lilikoi mojito. Made from Bacardi Silver, passion fruit puree, mint and soda my husband liked the flavor of the drink. My husband said that you could actually taste the flavor of the lilikoi and the mont and not just the booze, which my husband appreciated. 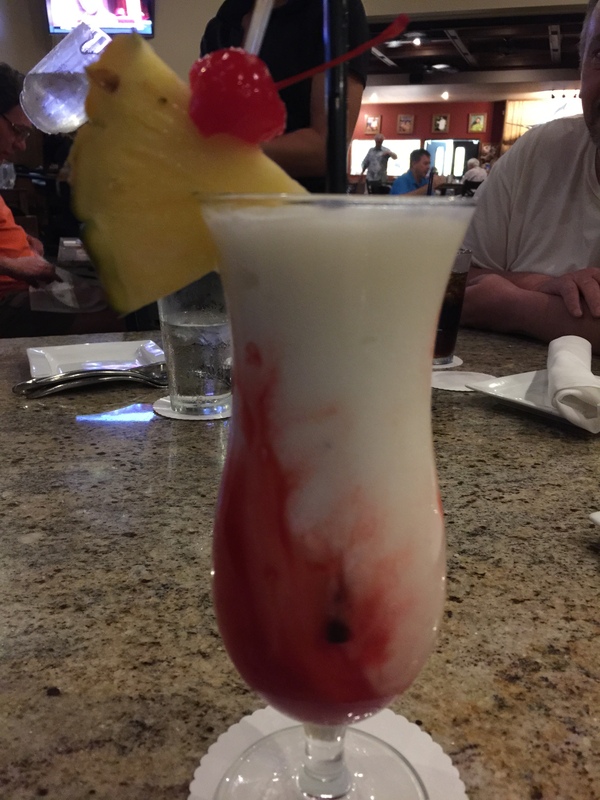 My brother-in-law also ordered a fruity drink for himself, one appropriately named the lava flow as we were in Hawaii. Made with Silver Rum, Coco Lopez, strawberry puree and pineapple juice, we all made fun of him for having ordered a “girly” drink. The drink sure did look pretty though, and while perhaps a little girly, I imagine with the combination of coconut and strawberry, the drink was probably pretty tropical. To start off our meal, my husband and I decided to order a couple of pupus, that’s the Hawaiian word for appetizers. First up, the brie wontons with Sam’s papaya marmalade. Squares of brie cheese are wrapped in wontons and then deep-fried to a golden brown until they are nice and crispy. Arranged on a plate with some papaya marmalade, which if you look closely spells out the word “aloha”, and finished with some green onions and black sesame seeds. The deep-frying of the wontons leaves the brie cheese nice and soft and melty so that it almost oozes out of the wontons when you bite into them. 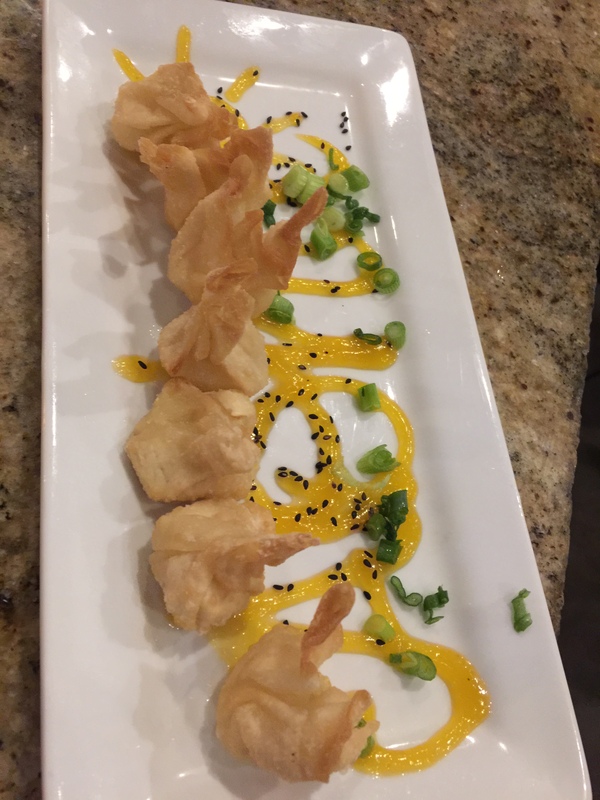 The wontons were perfectly fried so that they were crunchy and flaky. I’m not a big fan of brie, but these tasted fantastic. The papaya marmalade was also terrific, just that hint of fruitiness that goes so well with brie cheese, and a little bit of tang too. As it was a marmalade rather than a sauce, you could use the wontons to scoop up some of the marmalade so that it stuck to the wontons rather falling off in a liquid pool as a sauce would be apt to do. The combination of the marmalade with the brie was a terrific one bite appetizer. As we were in Hawaii, I couldn’t help but order a Hawaiian appetizer. 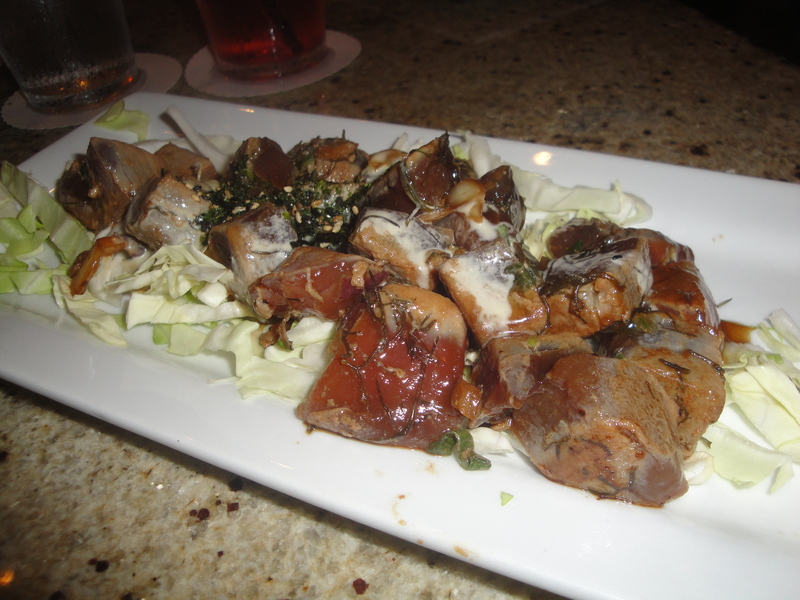 Sam Choy’s offered both a traditional poke called the shoyu poke tower or a different dish called Sam’s seared poke. I asked the waitress what she recommended and she said that while you could find traditional poke all over Hawaii, Sam Choy’s was known for their seared poke as it was just a little different from the normal poke you’d find anywhere else. That was as good of a reason as I needed to order it. As stated, the cubed pieces of fresh ahi tuna were seared quickly on the outside. The sear was a really great touch as it added a bit of added flavor to the poke. A little of the smoky, grill flavor which heightened the flavor of the poke dish as a whole. My husband and I agreed that the poke had terrific seaweed flavor and the added saltiness that comes with the seaweed. There was also a great soy sauce flavor to the dish as well. Poke was one of the dishes I had on my “must eat” list for our trip to Hawaii, and this seared poke was a real winner, and a truly Hawaiian dish. Kona Orange duck, roasted with five star spice, soy and Big Island orange sauce with honey and macadamia nuts is what my husband ordered for his dinner. Served with a side of white rice, my husband was surprised by just how large this entrée of duck was. 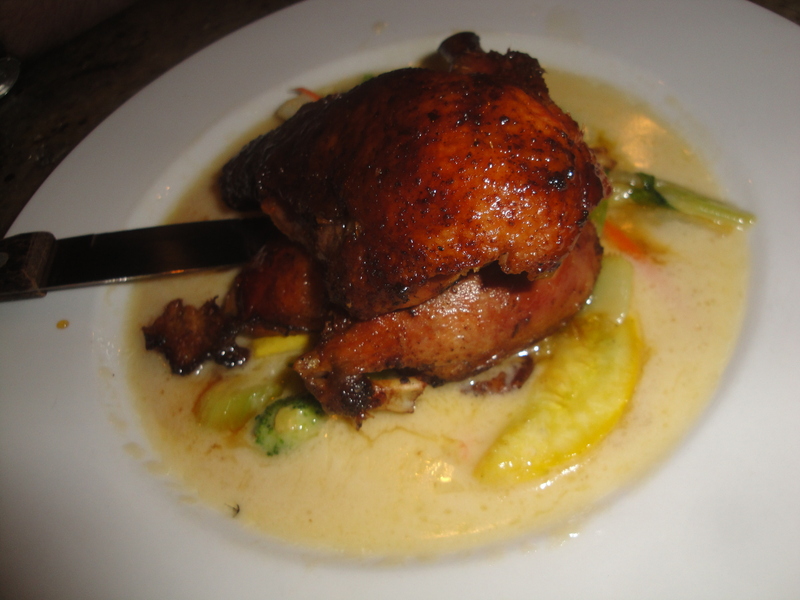 The orange sauce had tremendous flavor and the citrus flavor really paired well with the duck. The duck had a nice crispy skin to it, which my husband loved. And the meat was tender and flavorful. Definitely no complaint with this meal. 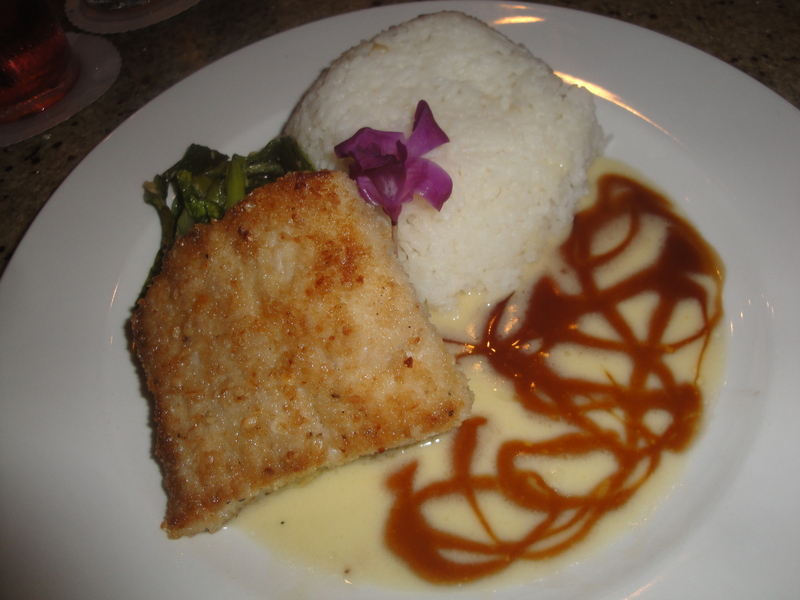 For my meal, I chose the macadamia nut crusted mahi mahi. After all, we are in Hawaii, right? So macadamia nut crusted fish sounds like a natural combination. Served with white rice, this was a beautifully plated dish. The macadamia nut crusting on the mahi mahi was terrific, crunchy and full of texture. The fish was nice and flaky and mild in flavor. The sautéed bok choy that also accompanied the dish was a nice accompaniment to the crusted mahi mahi. I thought that the sauce on the plate was just a bit too sweet for the fish and eventually I just decided to have the fish with the rice rather than trying to sop up any of the sauce on the plate. The entrée was nice and filling and I was really happy with my choice. As we hadn’t eaten all day until this dinner meal, my husband and I decided to split a dessert. 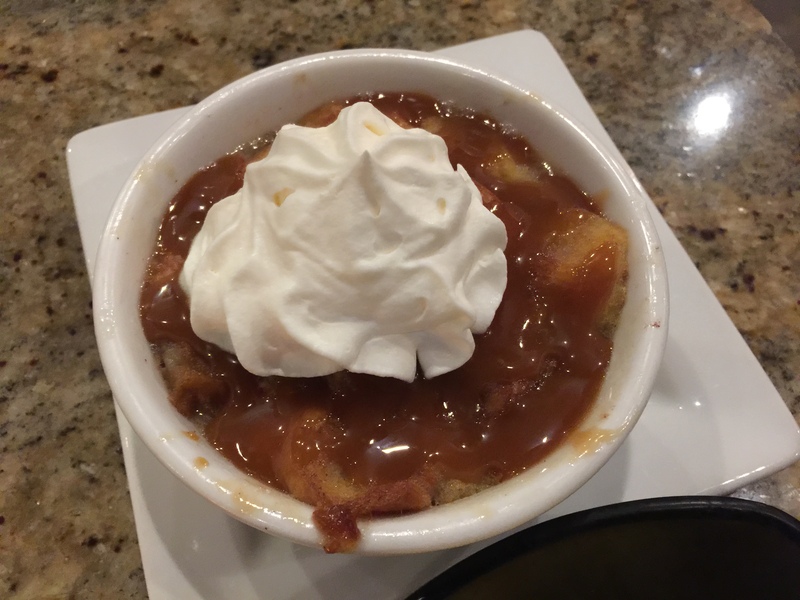 We chose Sam’s bread pudding with caramel sauce. 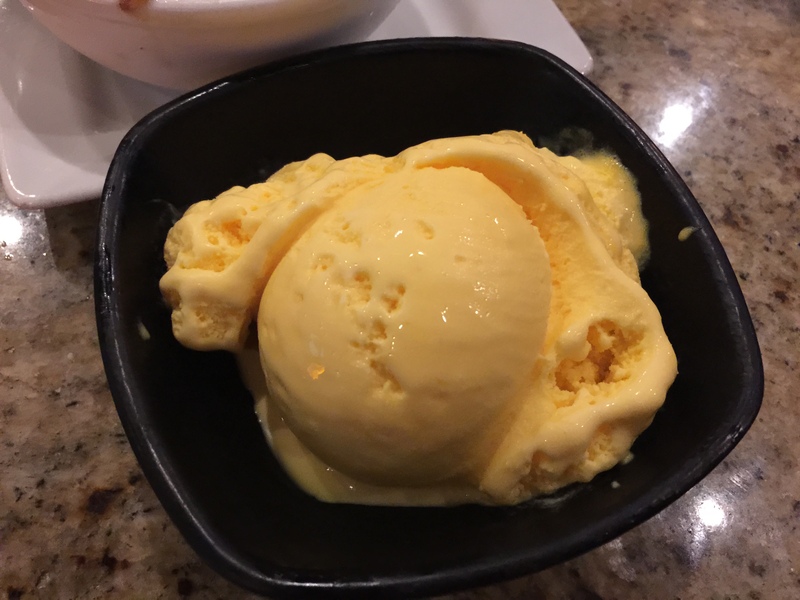 It came with ice cream to make it a la mode, and instead of choosing the traditional vanilla ice cream which would have gone well with bread pudding, we chose a scoop of mango ice cream instead. After all, when in Hawaii, why not go for mango ice cream? First off, the bread pudding was fantastic. Hot, and sweet and a little chewy, the bread was fantastic. As a bit of a surprise the bread pudding actually had some banana slices in it, and the caramelizing of the banana with the bread and caramel sauce was such a terrific combination. This may have been my favorite bread pudding ever. I’ve always wanted to love bread pudding, and while I’ve had some good bread pudding, I’ve never had one as terrific as this bread pudding. The combination of the sweet bread and caramel sauce and the bananas was just a terrific pairing. Then the mango ice cream, my husband and I both loved it. It was not too sweet, but creamy and had bits of frozen mango in it, which was a great touch. It tasted just like mango. The combination of the bread pudding and the mango ice cream was a weird one, but since we pretty much treated it as two separate desserts, it was perfect. A great ending to a terrific meal. For our first meal on this Hawaii trip, Sam Choy’s Kai Lanai, was a terrific choice. The indoor/outdoor setting of the restaurant was quintessentially Hawaiian. With tropical breezes and amazing views, why wouldn’t you want to take advantage of your natural surroundings by creating a setting that was laid back and where guests could enjoy the outdoors and the beauty that is the Big Island? With tropical drinks in hand, every member of our party was able to find food that was filling and satisfying and gave them a glimpse into Hawaiian food and cooking. After a day of traveling and trudging through airports, just being able to sit back, relax and unwind at the end of the day in the land of paradise is all we were looking for and Sam Choy’s delivered.